The skill of dribbling the ball is one of the most important factors in the sport of soccer. Dribbling is how soccer players transition the ball from one end of the field to another, weave in and out of the defense, and have a chance at scoring a goal. Speed, balance, endurance, agility, and body control are essential factors in making a soccer player successful in dribbling. Soccer dribbling requires players to have great footwork, control over the ball at all times, and the ability to quickly change directions. The idea is for a soccer player’s dribbling skills to become second nature, so when the time arises they naturally perform the necessary move for that particular situation. When dribbling, soccer players will face an opposing player that plays both man-marking and zone defense. Zone defense is when a defender covers a certain area of the field, rather then covering one specific player. Dribbling fundamentals are essential for the soccer player with the ball to get past a defender using zone defense. Soccer players with advanced dribbling skills are able to time their moves, get past the opposition, and continue dribbling to the goal. ching the opposing player, the player with the ball will use the outside of either foot to kick the ball to the side. 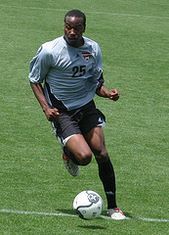 It is extremely important that the soccer player performing the cut knows exactly how hard to kick the ball. A side kick that is too soft makes it easy for the opposing player to take possession of the ball, while a side kick that is too hard can cause the player to lose control and possibly turn it over to the other team as well. blocking it. When a defender goes to block the shot that was never actually taken, this allows the player with the ball a short amount of time to dribble around them and shoot or pass to a more available player. When this skill is used on the goalie, it can lure them to try blocking the ball in the area they thought it was being kicked and leave other areas of the goal wide open. 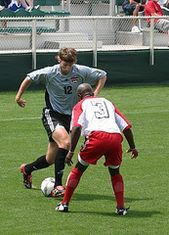 The Scissors Skill is performed when a soccer player moves one foot quickly around the front of the ball, while the other foot follows in the same manner but in the opposite motion. After crossing both feet around the front of the ball, the player will use the outside of either foot to cut the ball and continue dribbling around the defender. This is a dribbling skill that is used to confuse the defender and prevent them from determining which direction the player with the ball will be going in to get around them. When a soccer player faces a defender, they will often use their body for directional misleading. The player with the ball wants the defender to think they are going in one direction, when really they plan to go in the exact opposite direction. This dribbling skill is performed when a soccer player will jump to a side of the ball while using their shoulder and body to push their leading foot, then immediately step and go with the other foot in the opposite direction. When the defender is thrown off, the soccer player is able to continue dribbling the ball. Soccer players should continue tapping the ball with each step when dribbling down the field. Inexperienced players will often dribble the soccer ball too far ahead of the body and have a higher risk of losing control of the ball. Soccer players should know how to utilize the entire foot when dribbling. Some dribbling skills utilize specific areas of the foot, such as the inside or the outside. Soccer players should keep their head up while dribbling the ball to scan for opposing players approaching them or possible teammates to pass to. This means that a player must be extremely comfortable with dribbling the ball in order to be successful while the ball is in their possession. Soccer player's that have to continuously look down at the ball while dribbling will have a higher chance of having the ball stolen or missing opportunities to score. The Myosource Kinetic Bands are a great training tool that can be used to improve a soccer player's dribbling skills. The resistance bands will increase the muscle strength, flexibility, mobility, endurance, and stamina soccer player's need to dribble the ball in and out of the defense. The Myosource Kinetic Bands are also a great way to build the muscles in the lower body and core for quick twitch muscle contractions and reactors. The Myosource Kinetic Bands can be worn by the soccer players during their normal routines, such as warm ups, stretching, practicing, and pregame preparations. When practicing soccer dribbling drills, the player's should perform the drills while wearing the resistance bands and then perform the same drills immediately after removing them.